It's always nice to top a European Union league table and Latvians have done so in an area that is perhaps not always acknowledged - satisfaction with the promptness of trains. While Latvia's trains may not be the most modern, most comfortable or most accessible to users with disabilities, a recent report from Eurobarometer shows that while 59% of Europeans in general are satisfied with the punctuality and reliability of their trains, in Latvia the figure is 85%. "There is a fairly wide range of satisfaction levels across countries. Respondents in Latvia (85%), Austria (83%) and Ireland (82%) are the most likely to be satisfied with the punctuality and reliability of rail travel, compared to 42% in Romania, 44% in Bulgaria and 47% in France," says Eurobarometer. However, Latvians are less impressed by other aspects of travelling by rail such as the frequency of trains and handling of complaints. But in the overall satisfaction index of EU rail users, Latvians rate better than the EU average and ahead of both Estonia and Lithuania. 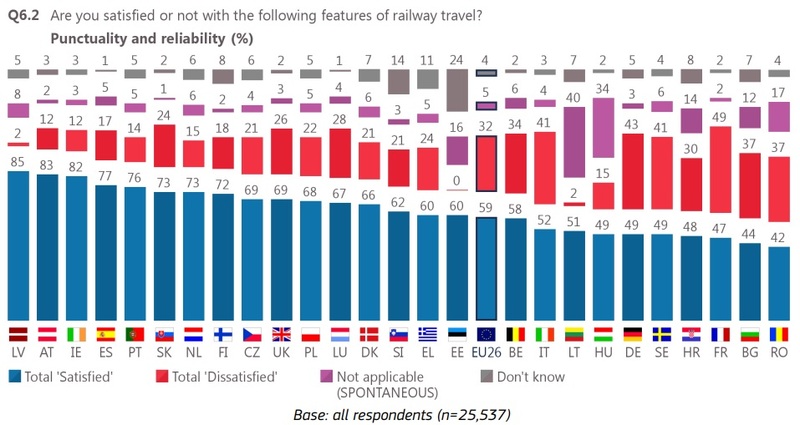 Travelers in Lithuania (44%), Latvia (40%), Bulgaria and Hungary (both 38%) are the most likely to use public transport to get from home to the railway station from home, while respondents in Slovakia (90%), Ireland, Luxembourg, the Czech Republic and Latvia (all 83%) are the most likely to be satisfied with the ease of buying tickets.